Has there been a process of engagement to understand the needs and aspirations of the community and other stakeholders? Are there good quality community facilities and services which are easily accessible? For example schools, recreational facilities, parks, libraries, healthcare facilities and frequent public transport. Is there a variety of housing provided for different types of households? For example, it caters for a wide range of budgets including affordable housing; different size households; and at different stages of life from young families to students and the elderly. Is there good access to a range of employment and education opportunities within the community and beyond? Are good telecommunication facilities provided? For example, high speed broadband, fibre to premises, and public wifi access. Are there advantages to businesses to locate there? For example some businesses, particularly services, do better if they are clustered together. Does it attract businesses to locate there? Is there passing trade for businesses where necessary? For example, there is a high volume of pedestrians walking past shops and cafes. Have the natural features of the area been protected or enhanced? For example, natural waterways, bushlands, habitat links and ecosystems. Do views, landscapes and other features create a distinct visual character? Does the proposal help reduce ‘heat island effect’™ through the use of trees and plants, and light coloured surfaces? Do the building materials reflect the local character of the place? Have opportunities been maximised to revitalise or retrofit existing precincts, places and buildings? Do new buildings and places blend with the existing character of the location and surrounding buildings? Are locally distinctive buildings and places retained? Will the development retain or create a local identity? For example, it reflects the cultural values of the community. Does the design create or enhance a sense of place and history? For example local heritage is preserved. A report looking at improving productivity in New Zealand by reshaping and refining cities (Spiller, M, 2006, SGS Economics & Planning). A discussion paper exploring the economic benefits of making cities more walking and cycling friendly (Tolley, R, 2011, Heart Foundation of South Australia). A database providing a collection of advocacy organisations, funding sources, media coverage, online tools and software focused on making cities better, more efficient and more resilient (TED). A paper considering the foundation, design and integration of knowledge precincts in cities (Baum, S, et. al., 2007, Griffith University). A document summarising key research showing investment in good design generates economic and social value (Commission for Architecture and the Built Environment (CABE), 2002). A technical paper using regression analysis to discuss the role of density, particularly the density of creative workers, as a key factor influencing regional innovation (Knudsen, B et. al., 2007). A guide on the planning and construction of green infrastructure including discussion of the role that green infrastructure can play in climate change adaptation (Australian Institute of Landscape Architects, 2011). A report outlining minimum standards and monitoring requirements for achieving sustainable buildings and towns (Bio-Regional & CABE, 2008). 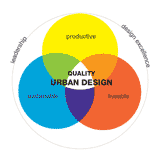 An integrated framework addressing how urban planning and design can support a sustainable and resilient food system (Donovan, J, Larsen, K & McWhinnie, J, 2011, a report commissioned by the National Heart Foundation of Australia – Victorian Division). A webpage on Water Sensitive Urban Design featuring policy and planning advice, case studies and information on maintenance requirements (Landcom, NSW). The website of the peak industry association for Australian urban water utilities.